Young rider well placed in Aust -- (Apr 28) Recently named a SPARC Future Champion, fifteen-year-old Amanda Goldsbury from Waipukurau, indicated her international potential finishing a very creditable individual third place in the IRT Pacific Challenge against riders from Australia, USA, Japan and South Africa. Riding Sieber, Goldsbury, the youngest competitor in the field, scored 64.36% and really impressed the connections of the Australian-owned horse. Goldsbury's ability has previously been well recognised in Australia by Katie Kelly from New South Wales. Kelly flies the youngster across the Tasman to compete on her ponies. At the same event as the international challenge Goldsbury rode two ponies for Kelly in the Preliminary Championships for a 1st, 2nd and 3rd placings. Albany's Andrea Bank finished 7th in International Challenge, and Hanna Buckleigh from Waimauku who went to Melbourne as an individual competitor, was placed fourth in the Freestyle to Music event. Saddling up for the first day at the Takaro cattle yards. 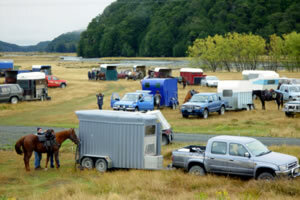 The Upukerora Valley Sponsored Horse Trek on 5 and 6 April turned out to be a truly international event with Kiwi, English, Scottish, German, American, Irish and Slovenian riders participating in the fundraising trek. The event was organized by Fiordland Health Property Trust in support of the new Health Centre in Te Anau. The site works for Stage 1 of the $2,7 million project started on 27 March and Southland Mayor Frana Cardno broke the ground for the facility just a day before the Trek, on 4 April 2003. "I can say that I had a fantastic time through some absolutely magnificent countryside," said Shelley Bell, from Invercargill. "I can now look back on the trek as a true highlight of my year so far." Time for a relaxed chat; from left Wayne Baxter and Barbi Kratzeisen from Tuatapere, and Owen and Trudy Evans from Longridge. The trek combined fundraising with giving riders the opportunity to experience some of the least ridden trails in the area. "It's been good for the horses and the owners," said Brian Potts from Longridge. "And we've met some interesting people." The trail boss was Allan Chalmers from Te Anau. The trek was planned to be an enjoyable event as well as give an experience to riders, and horses. However, safety was the main priority. "We are very satisfied as there were no injuries to either riders or horses," Mr Chalmers said. 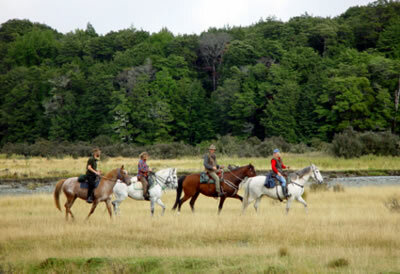 Starting from the Takaro cattle yards 30 km from Te Anau on Saturday morning, the party of weather hardened riders, novices, and young riders followed the trail past Takaro Lodge into the scenic upper reaches of the Upukerora River. Despite some rain in the afternoon the spirits were high. The youngest rider, eight and a-half year old Nicole White, from Invercargill staunchly negotiated the river crossings on her pony Curly and didn't even get her feet wet. The organisation committee heard from a well but - as it turned out - ill-informed source that Trust member Mayor Frana Cardno was a rider herself, and invited her to join. "I have only ever been on a old draft horse when l was kid and l even managed to fall off that ..." Not sure about the adventure, Mayor Cardno opted instead for the safer choice and joined the riders for the BBQ upon their return to Mr Chalmers' woolshed on Saturday night. A bonfire, roasted marshmallows and dance complemented the deliciously cooked meats by veteran Chef Robert Young, from Te Anau. Everyone thoroughly enjoyed themselves and some took part in late night yarns with a predominantly Irish theme. Participants, who came from as far as Ashburton, slept in their tents, horse floats, or in the woolshed. On Sunday the group rode in the lower part of the valley to the old coal mine and then returned to Allan Chalmers' farm. The Trust raised over $3,200 from the Trek and bar. "The interest from riders and the very positive feed back has encouraged us to plan this horse trek as an annual fundraising event for the project," said Diana Zadravec of the Trust. "Some riders have already asked to put their names down for next year's trek." The Trust would like to thank the following people for their enthusiasm and help with the organisation of the Trek: Allan Chalmers for offering accommodation, leading the Trek, and for the venison; Kevin Chalmers for help with organisation; Robert Young for being a brilliant main Chef; Stewart and Daphne Burnby for their help with the BBQ; Ken Adam for tending the bar; Helen McKay from Tuatapere for the donation of delicious salads; Takaro Lodge for the hogget and for hay for the horses; Fiordland Meat Wholesalers for a good deal on good sausages; and Fiordland Cycle and Mower Centre for the portable loos. We would also like to thank the DOC for waiving the concession fee for the Trek. NZ YR team third -- (Apr 24) The NZ Young Rider Dressage Team of Amanda Goldsbury (Waipukurau) and Andrea Bank (Albany) have finished third behind Australia and the USA in the IRT Pacific Challenge in Melbourne. The Australian team of Brett Davy and Sara Price scored 65.73% and 65.56% (Total 131.29) on the two very experienced horses, Mighty Heights (owned by Karin Davis who competed the horse in NZL in 2002) and APH Spiegal. The USA riders , Tina Hayden and Christine Beal scored 58.21% and 60.00% for a total of 118.21%. New Zealand was third on a total of 115.13%. Amanda Goldsbury riding Sieber, a 13 yr old trakehener gelding who normally competes at Prix St Georges level scored 61.03% and Andrea Bank scored 54.10% on Northern Charmer, a 9yr old bay Advanced medium mare. Japan was 4th on 113.08% and South Africa 5th on 110.85%. The individual titles will be decided today. Two Kiwis in IRT Pacific Challenge -- (Apr 22) New Zealand riders Amanda Goldsbury 15yrs, (Waipukurau) and Andrea Bank 16yrs, (Albany) will take on the world when they compete in the IRT Pacific Challenge against riders from Australia, Japan, South Africa, and the USA at the Stablemaster Australian Young Rider and Pony Dressage Championships in Werribee, Melbourne from 22- 24 April. This pair of young riders quinealled the Young Rider of the Year title at the Horse of the Year Show in Hastings recently, and hold a host of other national dressage titles betwen them. Both are members of the under 21 NZ Dressage Development Squad. Justine Kidd from Te Awamutu will manage the team. All teams including the Australians will ride experienced horses made available by the Australian organising commitee. Waitemata based rider Hanna Buckleigh with Shivas Regal (also a member of under 21 development squad) has entered the event as an individual competitor. Andrea Bank: Albany (Student) 2nd Pacific Zone FEI World Dressage Chllenge 2002 3rd Intermediate II & 4th Grand Prix Freestyle Bates Champs 2003. NZ Pony Champion 2003, NZ Young Rider Development Squad 2002/2003, Runner - up Young Rider of the Year 2003. Kiwi in qualifiers for SJ World Cup Final -- (Apr 4) Forty-two riders from 16 countries have qualified to compete at Budweiser World Cup 2003, the Show Jumping World Cup Final, April 16-20, at the Thomas & Mack Center in Las Vegas, Nevada. New Zealander Molly Savill is among the qualifiers, who earned the right to compete in Las Vegas by qualifying from eight leagues over the past year. They will compete amid the glitz and glamour of the Las Vegas lights. The United States, with 14, and Germany, with 10, have the greatest number of athletes participating in the competition. Brits quinella Kentucky 3DE -- (Apr 28) In her first visit to the Rolex Kentucky Three-Day Event, Great Britain's Pippa Funnell enjoyed a victory she will never forget. Riding last in the order in stadium jumping, the third and final phase of the Rolex Kentucky Three-Day Event, Funnell jumped all of the obstacles cleanly, but incurred six time faults to post the same score, 44.6 penalty points, as fellow Brit Polly Stockton. In the case of a tie at an International Equestrian Federation (FEI) sanctioned Three-Day Event, the rider whose time on the cross-country portion is the closest to the optimum time is awarded the win. A clear cross-country round for Funnell tipped the scales in her favor over Stockton, who incurred 1.2 time penalties during the cross-country phase. "Thank goodness I had a good day yesterday because I have never been so embarrassed by a show jumping ride in my life," said Funnell after realising she had exceeded the time allowed for the stadium jumping phase by such a large margin. "I was trying to do everything to leave the jumps up that I forgot to think about the clock! Somehow, the gods were with me!" Over the three phases of competition, Funnell, a two-time European Champion, led the 56-horse starting field from start to finish riding Primmore's Pride, a 10-year-old English thoroughbred gelding owned by Roger and Denise Lincoln. The victory earned her $US60,000 in prize money in addition to a Rolex timepiece. Stockton, 29, had one of only three clear stadium rounds to move into the runner-up position with Tangleman, a 10-year-old English-bred gelding. "My horse went clear and put the pressure on - it was a miracle, really," said Stockton. "I just wanted Pippa to do the best that she could do, we are all in it together and we all help each other." Countryman William Fox-Pitt, 34, ended his second visit to the Kentucky Horse Park in Lexington, KY, by finishing in third position with the Irish-bred Moon Man, one better than his fourth place finish in 2002 with Stunning. One knocked rail in stadium dropped him out of contention, bringing his three-day total to 46.6 penalty points. The British had a stranglehold on the event from the beginning, never relinquishing the top two spots throughout the competition. "I would like to say how grateful the British riders are for coming here and being made to feel so welcome," said Funnell. With the win, Funnell took the first step towards being the first rider to claim the $250,000 Rolex Grand Slam of Eventing, awarded to any rider who wins the Rolex Kentucky, Badminton and Burghley Four Star events in succession. The CCI**** Rolex Kentucky Three-Day Event, the only three-day event in America to be held at the Olympic level, serves as the US Equestrian Team (USET) Four-Star Championship. As the top American, fourth-placed Bruce 'Buck' Davidson, Jr., won his first Championship title aboard Mystic Mike, a 10-year-old American thoroughbred gelding bred by owner Janis Smith. "It's an exciting time," said Davidson, Jr. "Every time I go into the start box with 'Mikey', I think about breaking him as a two-year-old. To have him do this well is a dream come true." With a penalty-free stadium jumping round, Davidson, Jr. catapulted from eleventh position into fourth to win the USET Four-Star Championship. A true competitor, Davidson, Jr. commented, "Did I think that one day this would happen? Of course I did. Did I think that it would happen today? Last night, it didn't occur to me to even think about it! I just hope that I will not only have my name on this trophy a few times, but on the big one at the end of the day, too!" Davidson's father, Bruce, who has the distinction of winning the Rolex Kentucky Three-Day Event on six occasions, including the 1978 World Championships, finished in eighth position with Little Tricky. Draft passport legislation launched -- (Apr 28) Rural Affairs Minister Alun Michael chose last week's prestigious National Equine Forum, attended by HRH The Princess Royal, to launch the draft legislation on the requirement for equine passports. Speaking at the Forum on 'a government overview of the horse industry', Mr Michael summarised the draft legislation, which in line with the European Commission Decision 2000/68/EC, requires all equines in the UK to have a passport by 31 December 2003. He emphasised that there would be a three-month consultation period until 30th June, during which key equestrian organisations were invited to submit comments, before the document was finalised. Some sections of the draft gave a number of the 150 Forum attendees cause for concern. Noted as particularly worrying were the system of equine identification proposed which was seen to have shortfalls and also the compulsory and permanent passport declaration on whether or not horses were destined for entry into the food chain, which gave no flexibility for amendment should the horse enter new ownership. A highlight of the Forum was a perceptive presentation on the need to recruit, retain and recognise the worth of world-class grooms, from former international dressage groom, Lucy Katan. Lucy, who is now employed by The Blue Cross animal welfare charity, sparked an animated and supportive debate among the audience with her forthright recommendation that grooms should be treated as vital support staff within the World Class programme and with the respect and conditions they deserve. The National Equine Forum is the only independent conference for the horse world in the UK. It was founded in 1993 to provide an annual opportunity for communication in both directions between the grass roots administration of the horse world and those that influence decision making in government, industry and research in relation to horses and ponies. British riding clubs attempt record -- (Apr 28) British Riding Clubs (BRC) are to launch an advertising campaign in a bid to top their all time membership high of 2002. In the year following the Foot & Mouth disease outbreak, membership of affiliated Riding Clubs recovered and then exceeded all previous records to reach 36,000. The campaign for 2003 will feature a prize of a brand new computer for the affiliated club which increases its 2003 membership by the highest percentage. The winning club will be announced at the BRC Conference on November 16th. The membership drive will be supported by advertisements in the equestrian press, provision of posters to affiliated clubs for use in their areas, and the production and distribution of 'Join A Riding Club' leaflets around the UK. British Riding Clubs' general merchandise will also be launched during 2003, and will be available to purchase via the internet or directly from the office at Stoneleigh. In addition, the BRC website will be developed further, making information about the BRC movement and its affiliated clubs more accessible. A total of 114 of the 420 affiliated clubs now have websites of their own, with links to the main site. The riding club movement is going from strength to strength due to the hard work carried out by many volunteers. BRC caters for all levels of rider, with an established framework of rules, guidelines and advice, which ensure fairness and a level playing field for all. It is hoped that the prize of a computer will make the administration of club matters an easier task for the winning committee. German wins SJ World Cup Final -- (Apr 23) Marcus Ehning of Germany won the 25th annual FEI Show Jumping World Cup Final when the world's best show jumping horses and riders met to do battle at Budweiser World Cup 2003, April 16-20 at the Thomas & Mack Center in Las Vegas, Nevada. The international event featured 41 riders from around the world who competed for the prestigious title of World Cup Champion. Spectacular presentation of the sport with laser light shows, Las Vegas show acts, and the world-famous Budweiser Clydesdales made the World Cup a hit with everyone. Ehning put in a faultess performance in the final round of Budweiser World Cup competition on Sunday, April 20, riding his Oldenburg mare Anka to victory. Three-time World Cup Champion Rodrigo Pessoa of Brazil had to settle for the runner-up position this time aboard Baloubet du Rouet, owned by Diago Pereira Coutinho. Third went to Malin Baryard of Sweden riding Christina Larsson's H&M Butterfly Flip. The top U.S. rider was Laura Kraut of Oconomowoc, WI, who tied for fifth aboard Anthem, owned by the Summit Syndicate. Ehning received a wonderful birthday present a day late, as he had celebrated his 29th birthday on Saturday. "I can't believe it," he said. "I never thought I would win. If you think too much about it, it can hurt you, you need to go day to day." There was much to think about going into the last rounds of competition on the final day. Competition was fierce, and the top three were less than a rail apart in the placings. Going into Sunday's first round, Ehning and Pessoa were tied for second place with two faults, and Baryard was in the lead with a perfect score of zero. Ehning, a Sydney Olympic team Gold Medalist, went clear, Pessoa had a rail down to give him a total of six faults, and Baryard dropped a rail for four faults total. The second and final round saw Pessoa go clear, putting pressure on the remaining entries. The atmosphere was thick as Baryard entered the ring. If the young Swede had even one rail down, there would be no chance to win, as that would give her a total of eight faults to Pessoa's six. Unfortunately, she had a rail down and dropped to third place. Ehning was the last to go and had no room for error. One rail would tie him with Pessoa and force a jump-off. Two rails would give Pessoa the title. Ehning and Anka rose to the occasion leaving all the rails up and claiming the title of World Cup Champion. He threw down the reins and raised his arms in the air as the crowd rose to their feet cheering for the pair. It was a spectacular finish for the most prestigious show jumping competition in the world this year. Ehning's win made it two in a row for Germany, following Otto Becker's win at Leipzig last year. Germany now has three wins overall with Ludger Beerbaum having won at Gothenburg in 1993. The U.S. leads all nations with seven World Cup titles. The opening rounds leading up to the dramatic finish of the year's most important equestrian event in the entertainment capital of the world were just as action-packed as the concluding ones. Thursday, April 17, featured McLain Ward of Brewster, NY, riding Viktor, owned by Ward and Harry Gill, winning the first round of Budweiser Word Cup competition, a speed class in which faults are converted into seconds. Ward, one of the 14 riders representing the United States, had one rail down in the speed class, but was able to claim the win with his lightning fast time. The pair had a final score of 72.73. Baryard finished without any jumping faults, but at a slower time, placing her second. Pessoa was third. "He's a great horse," said Ward. "I made some small mistakes, but he bailed me out." Baryard was the runner-up in the second round of Budweiser World Cup 2003 on Friday evening, making her the overall leader going into Sunday's Final competition. The 28-year-old had a double clear, but could not beat the impressive jump-off time of Markus Merschformann of Germany. 33.25. Riding Camirez, owned by Gutsverwalltung Berl, Merschformann won the class with a faultless performance in a time of 31.60. Baryard was second with a time of 33.25, and Ehning finished in third place with a time of 34.04. The top U.S. rider of the evening was Leslie Howard of Westport, CT, on Priobert De Kalvarie, owned by Higher Grund Farm, who secured a place in the jump-off in the initial round, but had a rail down in the jump-off finishing sixth for the evening. On Saturday, six of the World Cup riders threw on blue jeans and donned cowboy hats in order to compete against six World Champion barrel racers in a barrel racing competition. Pessoa won the class easily, defeating the likes of three-time Olympic Gold Medalist Ludger Beerbaum of Germany, 2001 World Cup Champion Markus Fuchs of Switzerland, and US stars Ward, Howard, and Norman Dello Joio of Wellington, FL. Opening day featured an opportunity for spectators to cheer on their neighbors as the best local amateur riders of the state competed in the Nevada Team Invitational. The Red Team emerged victorious, consisting of Team Captain Amy Sears, Celebrity Captain and World Cup competitor, Richard Spooner, Darlene Hayes, Amanda Meyers, Whitney Stewart, Brittany Smith and Rita Koentopp. In addition, special ceremonies were held during the show. Prior to the start of Sunday's World Cup competition, four U.S. riders received Silver Medals for competing in 100 World Cup competitions. They were Donald Cheska, Beezie Madden, Eric Hasbrouck and Susie Hutchison. World Cup icon Max Ammann, director of the World Cup for the last 25 years, was honored for his service and dedication in a retirement celebration. Ammann created the World Cup and was largely responsible for making it the truly great event that it is today. Six former World Cup Champions paid tribute to him in the arena on Friday night on the occasion of his retirement. Street rider fights city -- (Apr 7) A Canadian horse trainer who lives outside the town of Grande Prairie, Alberta, has been given a ticket for violating animal control lasw by riding his hrse into town. Joe Gill, 22, has been told not to ride into town again. "It's pretty silly they don't allow this," he told the Grande Prairie Herald-Tribune. "Alberta is the cowboy capital of Canada. I'm not going to walk. I have a horse that needs to be ridden and I'm going to ride it, plain and simple." Gill has been warned previously about riding in city limits, but he says as the town is built on the farming and ranching industries, he should be allowed to. A city official says the law was needed "as horses could be startled by emergency vehicles or cause traffic jams." Forum on disabled dressage rider judging -- (Apr 4) Following up on the success of its initial judges forum last November, the National Disability Sports Alliance (NDSA), in association with USA Equestrian (USAE), held a forum on judging dressage riders with physical disabilities at Quiet Oaks Farm in Winter Garden, Florida, last month. The forum, recognized by the International Paralympic Equestrian Committee (IPEC), was designed to provide judges with an overview of all aspects of judging dressage for riders with disabilities. It included discussions of criteria for becoming an IPEC international judge, IPEC rules and dressage tests, USAE programs, and descriptions of recognized disabilities. There were also demonstrations and actual opportunities for judging riders with disabilities. IPEC Chairwoman Jonquil Solt and IPEC Master Judge Alison Mastin led the forum and there was a total of seven judges who participated. Three of these participants qualified to be named I.P.E.C. candidate judges, three were named I.P.E.C. provisional judges and one was designated a National Judge. "Once again, we got tremendous response to the judges forum," said Denise Avolio, NDSA Equestrian Program Manager who, along with Andrea Ice of USAE, coordinated the forum. "Our goal here is to provide new opportunities for riders with physical disabilities to compete. One way to do this is to open doors at established shows by expanding the pool of judges qualified to judge these riders." In IPEC classes, riders with disabilities are judged with able-bodied rules, but allowances are given for compensating aids. For example, in an IPEC class, special reins that can be held in one hand would not be penalized. Dressage trainer Ferdi Eilberg honoured -- (Apr 4) The British Horse Society has granted an Honorary Fellowship to Ferdi Eilberg, renowned dressage trainer and rider, in recognition of his services to horsemanship. He has been closely involved with the BHS for many years and leads the Society's Fellowship courses which are sponsored by the Worshipful Company of Saddlers. Granting the Fellowship is the highest accolade the Society can bestow on a trainer as it represents the pinnacle of equestrian professional qualifications. There are just 53 BHS Fellows and of these only Christopher Bartle is an Honorary appointment, all the others having taken an examination. Ferdi, who is 49 years old and based in Worcestershire, spent his early life in Germany, serving an apprenticeship with Olympic Gold medallist Dr Reiner Klimke before coming to England in 1980. Eleven years later Ferdi took out British citizenship and has achieved major successes as a top-level dressage competitor in this country including representing Great Britain at two European Championships, in 1993 and 1995, and at the World Equestrian Games in 1994. In 2002 Ferdi was appointed as the British Equestrian Federation's World Class Performance Director of Coaching and is now the BEF Acting World Class Performance Manager and Director of Coaching. USAE and USET submit bylaws to Olympic committee -- (Apr 3) The United States Equestrian Team (USET) and USA Equestrian (USAE) have submitted to the U.S. Olympic Committee (USOC) documents containing bylaws and an application to be the Olympic Sport Organization and National Governing Body (NGB) for the sport of equestrian. The new organization is to be formally called the United States Equestrian Federation, Inc. and it will be commonly referred to and marketed as U.S. Equestrian. The NGB Working Group of Armand Leone, Jr., Frank V. Lloyd, Kathy K. Meyer, David J. O'Connor, Howard Pike, Eric L. Straus, Bonnie B. Jenkins, Lori Rawls, James R. Wolf and counsel John Collins worked extensively on developing the bylaws. The final recognition of the US Equestrian Federation, Inc. as NGB will rest with the USOC Board in the autumn. USAE Vice President, David J. O'Connor said, "This is an important and exciting step in creating the new organization for the future of equestrian sport." Armand Leone, Jr., USET President, also hailed the submission. "The working group is to be commended for focusing on the mission at hand and the best interests of the sport. This is a great day for all involved in equestrian sports.